One of the better Star Wars spin-offs that captures the fun and action of the classics. I’ll be honest, when I first learned about Han Solo getting his own stand alone film, I wasn’t too excited about it like most people, as we were going to be given answers to questions no one asked. But when it started finally coming along after many production troubles and woes, I slowly become interested in how it would turn out. After seeing it in the theaters, I had a good time watching Solo: A Star Wars Story as it seemed to capture the fun and action of the original classic films. It might not be the best entry in this beloved franchise, but it’s definitely the most fun and one of the best (if not the best) spin-offs. Our editor Annette Palmer had a good time with this one like I did, and we even did a podcast on it just in case you missed it. You can also check out her review of the theatrical release in case you missed that too, and for all of the essential plot details and more. I’ll just jump into my two cents where I had a good time watching this one despite going in thinking it wasn’t going to be any fun. I’m glad I was proven wrong as there’s enough Star Wars action and humor here than you can throw a wookie at, and Chewbacca is mainly the reason I think a lot of people love this movie so much. Seeing him and Han together was always fun, despite Alden Ehrenreich not looking like Han most of the time, but he captured the essence pretty well. 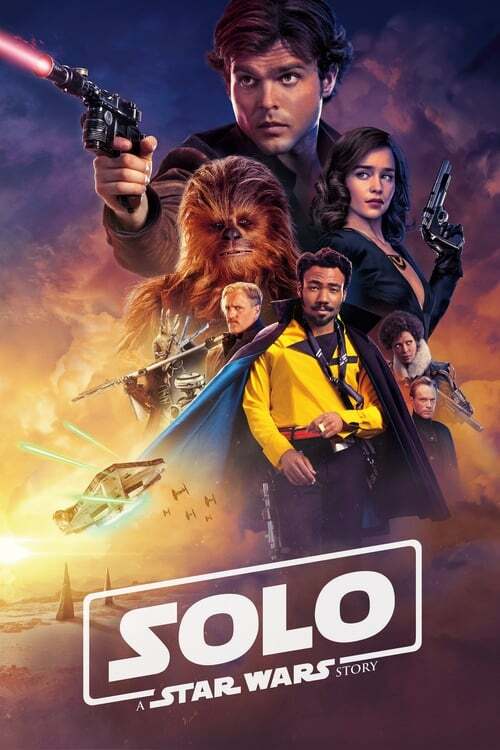 All of the side characters are really well done too, from Woody Harrelson and Thandie Newton playing smugglers in love who also teach Solo a few tricks, to Emilia Clarke playing Han’s love interest with a deadly secret to hide, to Donald Glover taking over the beloved Lando Calrissian. You can tell everyone had a good time with their roles and it shows, as there’s always something fun and interesting happening with the characters and the misadventures they get into. There’s also some pretty cool cameos and easter eggs to look out for as well, which should be easier to spot thanks to the high definition Blu-ray release here. There’s a 4K version as well, but the Blu-ray is no slouch with clean looking visuals and a crisp Dolby audio track that comes together for a fun time. There’s a few extras to take a look at after the film, such as a roundtable discussion featuring director Ron Howard and some of the cast that’s a fun watch. There’s also a few behind the scenes featurettes that go into the how the story and characters came about, filming some of the scenes, some deleted scenes that don’t really add or take away from the experience, and more. I wish Solo: A Star Wars Story had did better at the box office, but maybe the home video sales will make up for what it didn’t do in theaters. It’s a real shame too, as it’s easily one of the better spin-offs of the franchise that anybody who gives it a chance will enjoy. So if you’re looking for some cool and fun space adventures, then grab your dice and fly into this one.